UFO SIGHTINGS DAILY: Cattle Mutilations In Argentina Point To Scientific Studies, Sept 24, 2015, Video, UFO Sighting News. 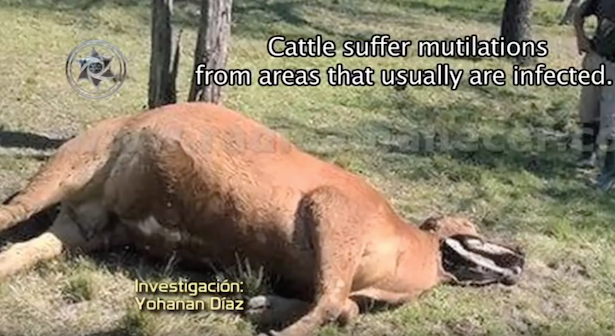 Cattle Mutilations In Argentina Point To Scientific Studies, Sept 24, 2015, Video, UFO Sighting News. This is very interesting. Cattle mutilations are still continuing. In Argentina last month they found three cows, all had specific areas of their body taken out, but all these areas were places that the animal could catch infections the easiest. Therefore, these body parts were taken to be studied. On September 24, 2015 in the town of Villa Cool in the province of Entre Rios, Argentina three cows and a bull were mutilated. They were extracted surgically, part of the jaw and lower lip on the left side, as well as their reproductive organs were missing.